The death toll from an apartment building collapse in the Russian city of Magnitogorsk has grown to 16 as rescue workers continue to search for more than 20 people still missing in the rubble. The front half of the 10-story apartment block was leveled by a suspected gas explosion on New Year’s Eve, burying dozens of people. The death toll is still expected to grow and emergency workers recovered the bodies of two women from the wreckage on Wednesday morning. 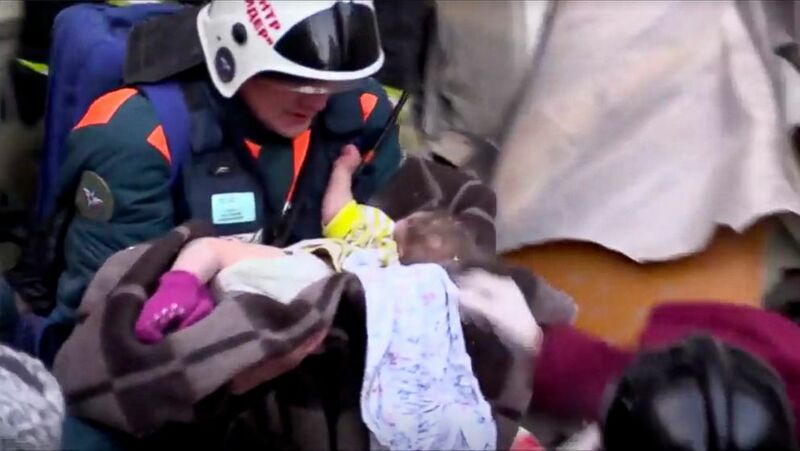 The collapse attracted international attention after a 10-month-old baby boy was pulled alive from the wreckage on Tuesday. The boy was found lying in his cot underneath heaps of rubble, more than a day after the explosion. Russia’s health ministry said the boy had been seriously hurt, suffering a brain injury and freezer burns to his extremities. He has been flown to Moscow for treatment, the Russian state news agency RIA Novosti reported. A rescuer carries a baby found alive in the rubble of a Russian apartment block that partially collapsed after a suspected gas blast in Magnitogorsk, Russia, Jan. 1, 2019. The boy’s parents both survived. His father, Evgeny Fokin, told the local news site Znak.com that he had put on clothes to resemble a rescue worker and passed the police cordon around the building to join the search for his son. He said he led rescuers to the area where he thought the boy might be buried. “It is a New Year’s gift, a New Year’s miracle,” Fokin said in a video posted by Znak.com. Police have said they believe the cause of the collapse was a gas explosion and Russia’s Investigative Committee, which handles serious crimes, has opened a criminal case on charges of negligence leading to death. As has happened with other large-scale disasters in Russia, an alternative version has taken root. Some have claimed on Russian social media that the blast might have been caused by terrorism, fueled by unsubstantiated media reports. Then on Tuesday a minibus caught ablaze in Magnitogorsk, killing three people. Two Russian news sites, Znak.com and 74.ru, suggested that those aboard had been suspected terrorists, killed during a police operation. Both outlets said witnesses had allegedly heard police engage in a gunfight with the men. Znak.com cited an unnamed official that terrorism was now being considered as the cause of the apartment building explosion and that traces of explosive had been found in one apartment there. The well-regarded Russian news site, Meduza, also reported that residents of another apartment building in Magnitogorsk had been evacuated by elite police. Local authorities have denied the fire was caused by a police operation and said it was prompted by an explosion of “gas equipment” in the vehicle. Responding to the reports, the Investigative Committee said it was still examining all possible versions for the building blast but so far explosives had not been found at the site of the collapse. Russia’s most prominent opposition figure, Alexey Navalny, has been re-tweeting posts suggesting the building collapse is linked to terrorism and Russian authorities are concealing it to downplay the threat of terrorist attacks in the country. Russia’s FSB service has not commented on the reports and previously said it considers a gas explosion to be the cause. The region’s governor, Boris Dubrovsky, told reporters on Tuesday it will take several more days to clear the building’s wreckage. A day of mourning has been declared in Magnitogorsk.